E-commerce plays a very important role in the economy of Hong Kong (HK). Statista recorded revenue of US$4.8 billion in HK on the e-commerce sector alone in 2019. The same report states that the revenue is expected to show an annual growth rate (CAGR 2019-2023) of 7.4%, resulting in a market volume of US$6.4 billion by 2023. This indicates an incredible potential in the e-commerce sector in HK for the next four years. 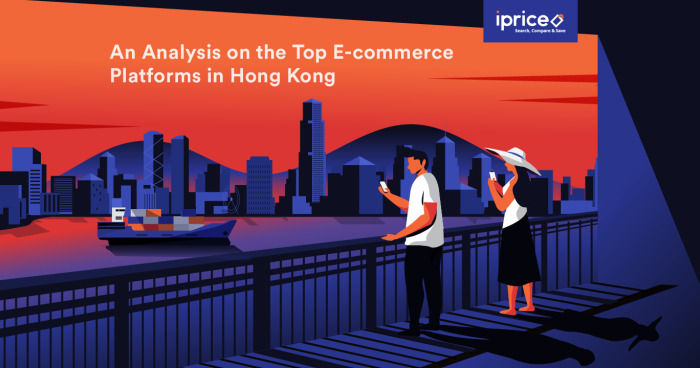 To find out who are the top e-commerce players in HK, iPrice recently conducted a market analysis utilising data such as the average total visits (desktop and mobile web) and mobile application rankings (both iOS App Store and Google Play Store). To ensure a fair analysis and comparison, our report focuses on e-commerce companies based in HK, international companies with an official HK specific domain and selected international platforms that are most popularly used among consumers in HK. In Q4 2018, Tmall takes the lead with an average of 7.9 million total visits (desktop and mobile web) compared to DC Fever (5.6 million) and HKTV Mall (4.4 million). Tmall.hk’s parent company, Alibaba invested heavily in marketing the Singles’ Day sales, this would explain the flare in November 2018 with a whopping 10.1 million total visits (desktop and mobile web) in that month alone. However, in December 2018 Tmall experienced a drop of total visits by 3.9 million which could indicate that Christmas Sales is not as big compared to the Singles’ Day sales. Both DC Fever and HKTV Mall displayed the same pattern as Tmall in November compared to December. However, e-commerce platforms are expected to rebound in January 2019 in conjunction with the pre-Chinese New Year festivities. DC Fever and HKTV Mall experienced a 10% increase in total visits in January 2019. HK consumers are avid shoppers at international e-commerce platforms as well. Among the most visited international e-commerce platforms are China-based websites Taobao and JD. As of January 2019, Taobao has over 601 million in total worldwide visits (desktop and mobile web) and 3.98% of visitors were from HK. This equivalent to 23.95 million visits from HK in January 2019, which has a population of 7.5 million as of 2019. In that same month, the top five e-commerce platforms in HK, notably JD.com (5.2M), Tmall (7.9M), DC Fever (4.2M) and HKTV Mall (4.5M), garnered lesser total visits as compared to the e-commerce platform by Alibaba. This indicates that Taobao is the most visited e-commerce platform in HK from the estimation based on SimilarWeb’s data. According to the South China Morning Post, HK is now a battlefield for China’s Singles’ Day sales. Given that Alibaba, the parent company of Taobao and Tmall was the first to popularise the Singles’ Day sales, they successfully obtained a record-breaking US$ 18.26 billion within just 24 hours. Just last year, JD.com had followed the move made by Alibaba Group and had launched their first Singles’ Day sales in 2018. Jake Yu, head of supply chain from JD.com stated “Hong Kong consumers are very picky and have an international mindset. If we can win them over, we can win the rest of the world over”. Within the Singles’ Day sales period which takes place in November, JD.com customers were rewarded with free shipping for shopping on their website and coupons for those new to the online platform. This could explain the rising popularity of JD.com in HK in recent times and they are most likely to remain as one of the most visited e-commerce platforms in the country. On the other hand, consumers purchasing behaviour on desktops and mobile phones are very different. This is evident as studies such as the one conducted by KPMG in 2017 shows that mobile strategies had doubled payment transactions compared to 2016. Therefore, it is vital to analyse the highest-ranking mobile shopping applications to ascertain the top e-commerce players in HK. This analysis was done by averaging the rankings of the top mobile shopping applications on both Google Play Store and iOS App Store. We ranked the applications according to the highest average rank recorded between 19 November 2018 and 11 February 2019. From our analysis, Taobao is strong in the lead for both their website and applications on both app stores (Google Play Store and iOS App Store). This reaffirms Taobao’s market-leading position in HK as they are also the most visited (on desktop and mobile web) e-commerce platform according to our estimates. Supporting this claim is KPMG, who confirms that Taobao has been leading the market since 2017 and 45% of online consumers tend to make purchases on the platform owned by Alibaba. Our analysis also indicates that HK consumers have an affinity towards fashion specific applications such as Zalora, ASOS, and Farfetch. This aligns with the survey by KPMG in 2017, where 62% more likely to purchase fashion products online. Amazon remains as one of the top shopping apps in HK as of Q4 2018 in both app stores. In our analysis, the American-based mobile app is more popular on Android as compared to Apple mobile devices. Given that Taobao is currently leading the e-commerce platform according to our estimates in January 2019, it is likely to see as a continuing trend in the remaining months (February and March) of Q1 2019. Solidifying Alibaba’s leading position in HK would be Tmall as well. This is evident as Tmall garnered more than 10 million in total visits (desktop and mobile web) in January 2019 while DC Fever obtained 4.2 million total visits (desktop and mobile web) in the same month. In the long run, it is very possible to see the prominence of either new or mid-field e-commerce players taking over the leading spots. There is great untapped potential in the HK e-commerce sector. As stated by Statista, e-commerce revenues are expected to push up to US$6.4 billion by 2023. Moreover, given that the 11.11 sales are still relatively new and increasing rapidly in popularity and demand, this would encourage further participation from new and emerging e-commerce players to gain a big piece of the action. Data was collected as of February 2019. All data on the total visits on desktop and mobile web in this study were taken from global traffic figures from the respective websites except for Taobao and JD.com. Estimates on total visits from desktop and mobile web on Taobao and JD.com from Hong Kong were based on data by SimilarWeb. Insights based on SimilarWeb data. App Ranking - Average ranking of mobile app 19th November 2018 – 11th February 2019. Source: AppAnnie. The following industries were not included in our analysis: e-ticketing, financial services, rental services, insurance, delivery service, food & beverage, meta-search, couponing, cashback websites and e-commerce platforms who solely provides classified ads/P2P services. E-commerce companies who initiated their business as a physical store were not included in our analysis. This is an expert finding by iPrice Group.